Two skiers collide at high speed on a windswept mountainside. What do you do? At a junction between two pistes, four skiers collide at speed. Skis and poles go flying, the skiers bounce across the snow and come to a halt. They appear lifeless. What do you do? Many of us would rack our brains for memories of that first-aid course years ago. We would probably also wish we knew the local emergency phone number. 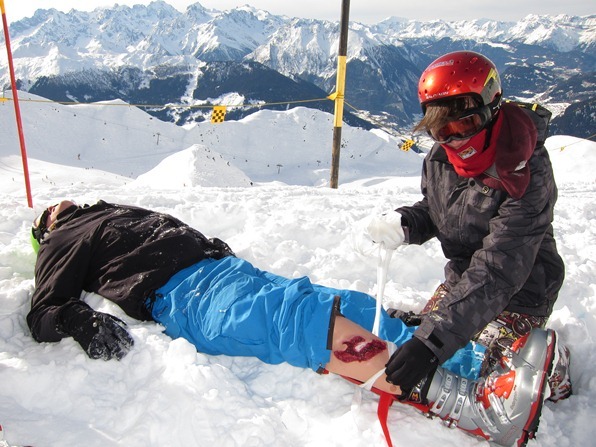 Today, as part of our training to become ski instructors, we are doing a weekend course in first aid – and the carnage on the snow is simulated. We stick crossed skis in the snow as a warning to others, and attempt to elicit a response from the casualties. A couple are faking unconsciousness: we monitor their breathing, put them into the recovery position, and check for injuries. Meanwhile, one of us pretends to phone for help. The emergency services number for most of Europe is 112; for Swiss mountain rescue, call 144. You will find the best number to use printed on your piste map; key it into your mobile as soon as you arrive in a resort. 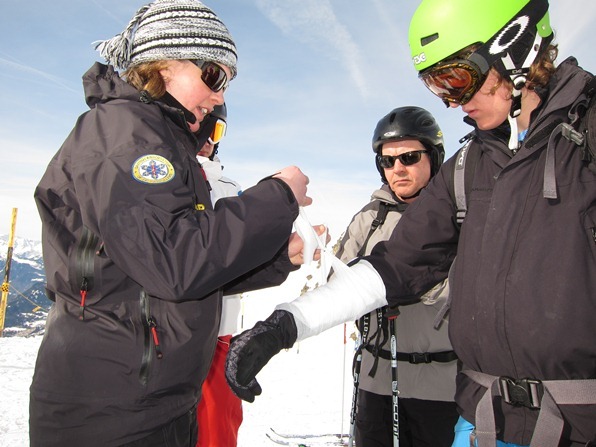 Our trainer, Christine Gillespie – a ski patroller from Glencoe – tests us on different injuries. Have any of us skiers ever broken a bone, she asks? Alan Smith, a 51-year-old IT programme manager from Aberdeen, says he has broken his arm: a double fracture of the humerus. Particularly painful was the way the nurses at the hospital came in for a giggle at the patient in leopard skin leggings and a Rod Stewart wig: he had fallen down some steps at a fancy-dress party. 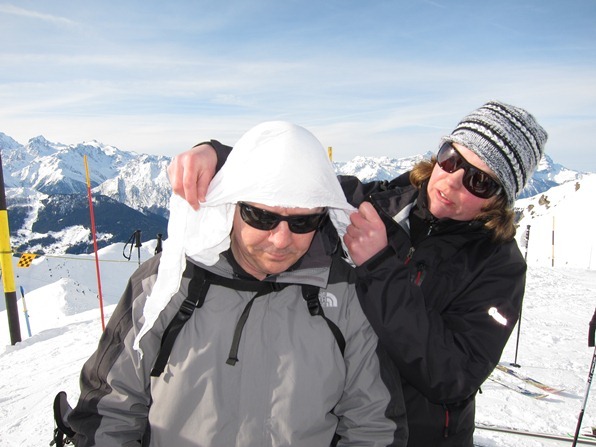 It soon becomes obvious that administering first aid is even more challenging than usual when you are lumbering around in ski boots in deep snow on a steep slope – trying to monitor casualties’ breathing and checking them for injuries when they are wearing umpteen layers of puffy clothing. Our weekend course begins with a day of lectures and training indoors, led by Chris, Christine, Willie – another mountain rescuer from Scotland – and Andy, a helicopter-based paramedic working in the Lake District. We learn how to deal with medical emergencies that are a result of existing conditions – from angina and asthma to diabetes and epilepsy. We learn what action to take in the case of a heart attack, a stroke or anaphylactic shock. We practise giving CPR (cardiopulmonary resuscitation) to plastic dummies, and putting unconscious casualties into the recovery position. But practising these techniques on a carpet in a warm room is a far cry from carrying them out on a cold, blustery, snow-covered mountainside, as we discover with Christine the next day. Even checking for signs of life can be all but impossible. In conditions such as these, core temperature can only reliably be measured with a rectal thermometer (“no, I don’t carry one,” says Christine), while measuring a patient’s weak pulse can be tricky, especially when your own pulse is racing. “With all the adrenalin going around my own body, I’d get a pulse of 120 off my skis,” says Christine. Which is why the most reliable sign of life in an unconscious casualty is their breathing – and we spend a lot of time practising monitoring this. However, you would rarely come across an unconscious casualty, says Christine. In her work as ski patroller at Glencoe she has to deal with “lots of knees and shoulders”, as well as broken bones, suspected spine injuries, dislocations (commonest are shoulders, along with the odd thumb and kneecap), ligament tears, and bumped bottoms – perhaps with a chipped pelvis or coccyx. For us on the course, that powder is one of the reasons we are here. We may now have only a tiny fraction of the expertise of Christine and her colleagues; but it’s reassuring to know that if we do witness an accident on the mountain, we have some idea of what to do in those vital few minutes before professional help arrives. For further information on first-aid courses, visit www.basp.org.uk. You are being swept away by an avalanche. What does it feel like? Swimming in white powder, a mountain-sized pillow fight, surfing on snow? Think more along the lines of a mafia burial: poured into freezing, quick-setting plaster, and left to suffocate. I am on a course in mountain safety and avalanche awareness, and our instructor, Peter Mason – an American-born mountain guide based near Chamonix – is explaining how a falling avalanche releases energy. This melts some of the snow – which refreezes on coming to a halt. Pete tells us about the time at guide school in Italy when his group set off an avalanche. “It wasn’t a steep slope. We were ski touring through the trees, climbing on skins, when one of the students got caught. He was somewhere flat, but above him was a little slope – and the slope went whoomph, making almost zero noise. We saw him being knocked over, and then completely buried. “His hand was sticking out, so we could get to him and clear the snow away from his face quickly. We dug down to his torso and tried to pull him out, but we couldn’t. Even when we cleared one leg completely, and the other leg down to his boot, we couldn’t pull him out – he was screaming ‘you’re twisting my leg.’ We only released him when he was 100 per cent clear – the snow had set solid. 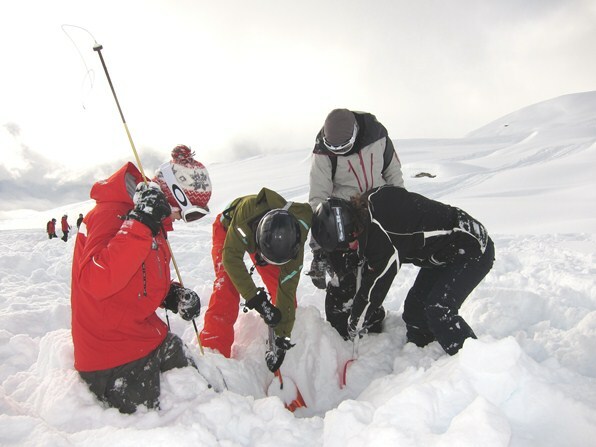 According to the SLF, the Institute for Snow and Avalanche Research in Davos (www.slf.ch), about 25 people die in avalanches every year in Switzerland alone. Ninety per cent set off the avalanche themselves. Your chances of surviving fall sharply the longer you are buried: from 80 per cent after 15 minutes, to 40 per cent after 30 minutes, and just 25 per cent after an hour. This winter began badly. Six died in the Trentino region in Italy during Christmas week when two skiers went missing – and four mountain rescuers sent to find them were killed in a second avalanche. Just after New Year, 11 ski tourers were buried in an avalanche in the Diemtigtal in Switzerland: six died, plus a rescuer killed in a second avalanche. 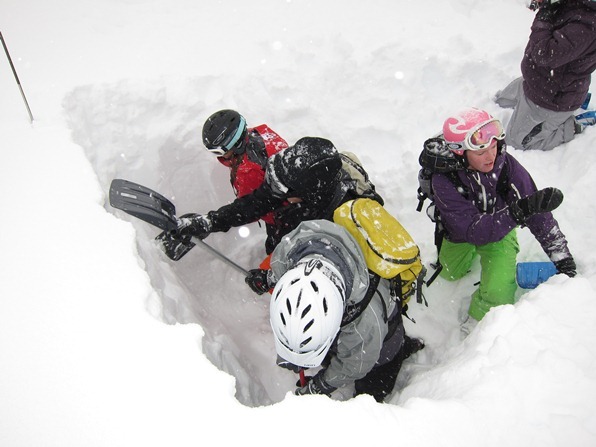 We dig a snow hole to look for evidence, using our collapsible snow shovels – part of the essential safety kit for skiing off-piste. Soon we have a smooth, sheer wall, about two metres deep, down to ground level. Pete brushes his hand down the wall (picture, right); there are distinct layers where he can push his hand more easily into the snow. Here, the snow granules are larger; and sure enough, right at the bottom, we find the largest granules of all: a slippery layer that makes the whole snowpack unstable. 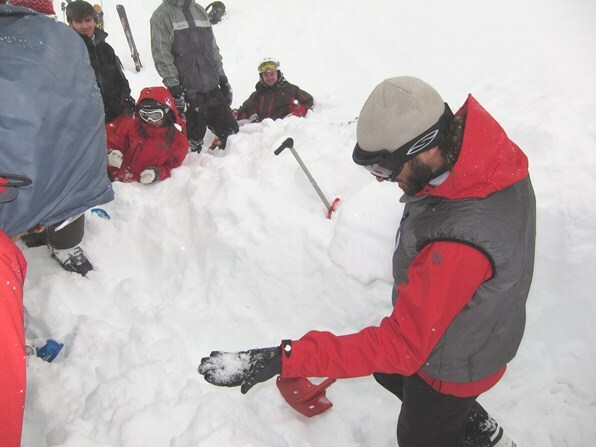 We also learn how to use avalanche transceivers, before putting a couple in backpacks, burying them in the snow, and then practising homing in on the signals (picture, top of story). To pinpoint the backpacks precisely, we use collapsible probes – the third key piece of kit. And the best way to avoid doing that is to take a specialist course. You need to learn to identify the telltale signs of avalanche risk in the landscape; find out how the likelihood of avalanche varies with the gradient of a slope, and the direction it faces; learn to interpret the daily avalanche bulletins, and to use large-scale maps to navigate safely. You need to find out how to move safely in a group over the snow, how to identify safe zones, and how to ski in such a way that you put the minimum stress on the snowpack. 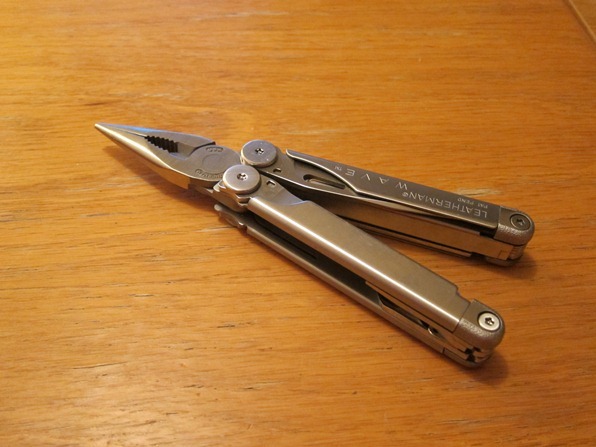 Mastering these skills could save your life. You can learn them in various ways: as part of a touring holiday with Ski Freshtracks (www.skifreshtracks.co.uk), operated by the Ski Club of Great Britain; on a dedicated course with Mountain Tracks (www.mountaintracks.co.uk); or through a local specialist mountain-guide agency such as Chamonix-based Wilderplaces (www.wilderplaces.com). The avalanche awareness training formed part of a ski instructor course with the Warren Smith Ski Academy (www.warrensmith-skiacademy.com). Further information: the Switzerland Travel Centre (00800 100 200 30, www.MySwitzerland.com) and the local tourist office (www.verbier.ch). 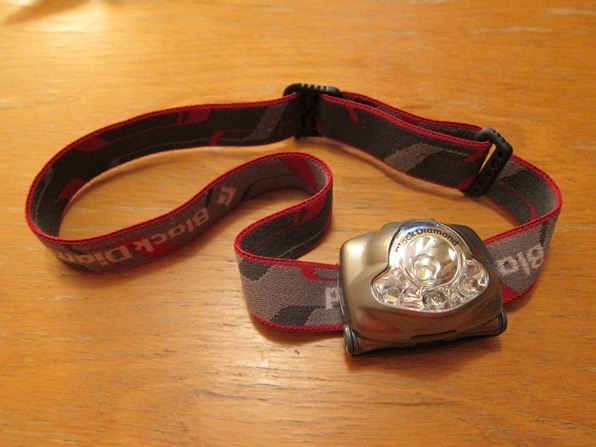 Have you ever puzzled over what you should put in your backpack for a day’s off-piste skiing? Here are some tips from a professional. Peter Mason is a 35-year-old mountain guide based in St. Gervais in the French Alps. 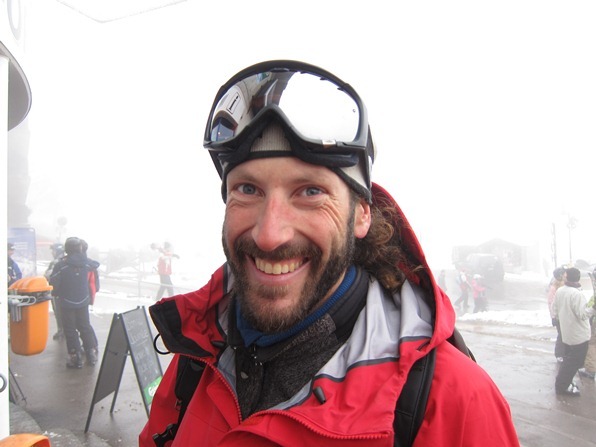 Originally from New York state, he moved to France in 2003, and gained full qualification as a mountain guide in June 2009 – only the second US citizen to do so through the French guide programme. He told me what he considers to be the day pack essentials for off-piste skiing and for ski touring. 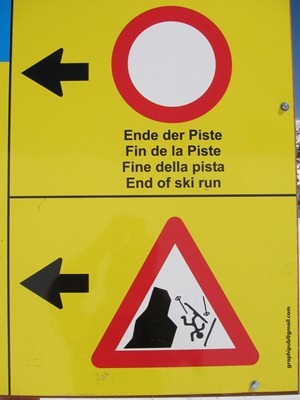 Those planning to stay on piste will find some handy ideas too. Peter Mason was teaching mountaincraft skills as part of a ski instructor course with the Warren Smith Ski Academy (www.warrensmith-skiacademy.com).